Every year our family comes up with a summer bucket list (SBL) of things we’d like to do before the end of the summer. Even though we try to get through our list, there’s always a few things that we miss since we’ve got stiff competition with summer camps, swimming pool fun and unstructured free play (nothing beats a game of hide-n-seek at dusk with neighborhood friends). I thought it would be fun to open up our summer bucket list to our FFC family to see what they have on the horizon and also to see what things your family would like to do this summer. So leave us a comment and tell us what’s on your “SBL” for family fun! Dinner at Jolly’s Drive-In restaurant, ice cream at Flub’s then the Holiday Auto Theatre Drive-In – Hamilton, Ohio (I got inspired after getting this great suggestion from a MasonMetu reader). Gorman Heritage Farm – Evendale, Ohio. Trammel Fossil Park – Sharonville, Ohio (after reading Karen’s post here on FFC, I know my girls would love digging for fossils). Summer movie in a park – We live in Deerfield Township and love going to the Friday Night Movie’s in the Park. See Shannan’s post on other great places for free summer movie fun. Miniature golf (S really wants to go to Monster Mini Golf in West Chester and I’m sure Dad will be okay with that). The Rootbeer Stand – This is on our SBL every summer – see my post on FFC from last year to see what it’s all about – Sharonville, Ohio. Swimming – We’ll be heading to Lifetime Fitness a lot this summer for some fun in the sun. 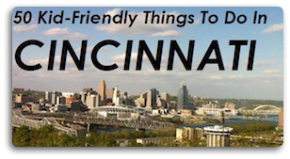 You can also see Karen’s post on great places to swim in Greater Cincinnati for more places to take a dip. Camping – This year we are actually going to family camp at Camp Kern so we’ve got this one covered. The Cone & Tucker’s Whippy Dip – We’ve already met our goals for these great soft serve ice cream places and I know we’ll visit a few more times this summer. The chocolate covered frozen banana with nuts at Whippy Dip is my favorite! Kings Island Dinosaur Park – We’ve got season passes but we’ll have to pay extra to see Dinosaurs Alive ($5 extra with park admission or $7 for exhibit and 3D Dinosaur film). Park/Playground – Easy to meet this goal – We visited Pine Hill Lakes Park to celebrate the last day of school and we just went to Sawyer Point/Yeatman’s Cove downtown and played in the wet sprayground (so much fun). 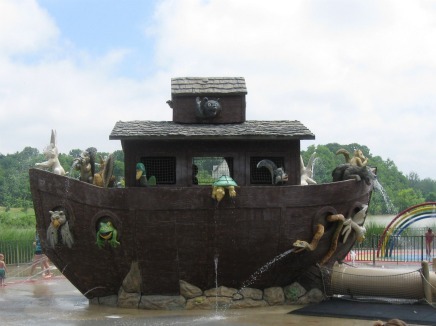 Parky’s Ark wet playground – Winton Woods – Only $2.00/child to enjoy this fun wet water playground – bring sunscreen and towels. They have a snack bar on site or you can bring your own lunch. Located in Winton Woods. 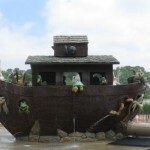 See my Winton Woods post from last year about all the fun you can have. Karen E. – “My kids want to play Putt Putt Golf, go to the Ocean and go to Kings Island (we’ve done that one!)”. Phyllis M. – “World of Golf.” – Florence, KY.
Katie S. – Katie sat down with her family and developed a long list of things they wish to do this summer, including – the Cincinnati Zoo, story time at the Kenton County Public Library, Cincinnati Museum Center and many many more cool places & activities around town. Thus that’s why this pararaph is amazing. Thanks!